Settting: The Imperial Palace on Shan Mountain in Dian Province, 22nd morning of Midsummer in the 300th Year of the Monkey. Once the spell of climbing has been cast on Flarrgj, Fugen, and Kierna, it is time for the spell of shrinking. The three halflings- Gizerak, Nimdor, and Takeshi- are all reduced to one-eighth of their normal weight. When Takeshi shrinks, it causes his dire badger Daisuke to shrink as well. The miniature halflings and badger clamber onto Termix. Then they are all secured together with rope, and all is ready for the climb. The three climbers scale the small cliff. Once they reach the lip, they are confronted with the long slope up to the palace. They race up, and in only a minute they are at the base of the palace wall. It is seems strange to touch this giant structure that they have seen so often from a distance. 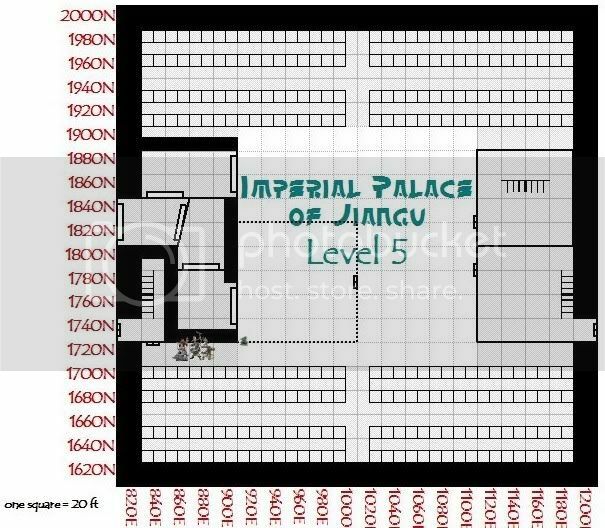 During all of their adventures in Dian the palace has been visible far above and miles away. Now they are here! The climbers scale the wall. It is a great height, but the spell allows them to rise easily. They would climb even faster, but they are limited by the speed that Termix can rise with his levitation spell. Even so, they are at the top of the Western tower before the end of the next minute. There is no sign that they were detected as they climbed. They heave themselves over the battlements. From here they can see the taller interior towers which were blocked from view earlier when they looked up from the base of the outer walls. shrunken halfling+gear: approximately 6 lbs. shrunken dire badger approx 15 lbs. Total burden for Termix 33 lbs+ normal gear. Termix is encumbered. Heroes are at 020E/840N. All of the spells are still in effect and everyone is tethered together. Last edited by crueldespot; 8th of December, 2007 at 20:40. Well I'll be baked over an oven of hot coals, stir fried and served with a plate of mashed potatoes, but it worked. Hmmm, now that I think about it, I'm hungry. Guess that means I'll have to make sure I survive this one too, or I'll never eat again. What a shame that'd be. Alright Nimdor, focus. Once on the wall, Nimdor jumps off of Termix's back. Untying the rope, Fugen signs to the others that they should head for the North gate to see if they couldn't clear it out as an escape route, seeing as the spells that would allow them to go back over the wall would expire and they might need a way out. "We should get off the wall, into the shadows, quick. We are exposed up here." He begins looking around for a staircase or something to decend from the wall. Nimdor is already working, making himself as hard to see as possible while waiting for the others to decide which way to go. The heroes untie themselves from each other and move briskly towards the northernmost hatch. Termix is moving slowly, still encumbered by the two other shrunken halflings and dire badger. The shrunken Nimdor also has trouble keeping up on his own. They must walk over several hundred feet to reach the hatch. The unencumbered humans get there first. It is a mundane-looking double door built into the floor, sheltering a flight of stairs down. It does not appear locked. Flarrgj moves to open the door if no one else objects, and atempts to do it quietly. "Is there any way to get rid of this shrinking effect? It's really weird." The spell of reduction is dismissable; so once Nimdor complains, he and the others are restored to normal size with a snap of the fingers. Flarrgj opens the hatch, revealing a staircase down to the top level within the tower. They quickly find another staircase that descends through the living quarters and the dining rooms down to the kitchen level. There is always the faint scent of decay as the corpses have not been cleared from this part of the palace. The smell is bearable since the area is fairly well ventilated. Open windows overlook the courtyard in the middle of the tower. From the kitchen level they pass through a wide and plain gateway into the chamberlain's domain. This is the area where the logistics of the palace was staged. Workshops for maintenance, storage areas for seasonal items, and warehouses for supplies fill the chamberlain's area of the palace. This area is dark and stuffy. There are a few magical fires for light, but no windows. There are few bodies in this area but the lack of ventilation makes the smell seem worse. The heroes do not encounter any surprises as they navigate through the rooms towards the gate tower. The area adjacent to the gate tower is the central receiving area of the chamberlain. On the far side they pass through another double door. On the far side, they can tell that they are passing through the wall of the gate tower. They are in a small room (by palace standards) that connects the central receiving area to the main area of the gate tower. Fugen and Takeshi remember the large open area that they anticipate to find on the other side of the door. It will be the courtyard within the gate tower. There is a fenced area in this courtyard where visitors and merchants were held until their credentials were inspected. On both sides are large stables where the nobles and cavalry as well as visitors keep their horses, Now only a set of double doors lies between the heroes and the area in the center of the gate tower. Last edited by crueldespot; 14th of December, 2007 at 16:41. Nimdor very carefully sneaks ahead of the group, knowing his stealth skills are superior, and acts as a scout to make sure they don't walk into any suprises. Recalling that their prisoner said there were ettins guarding the gates and that ettins were rather tall, Fugen takes advantage of the spider climb spell that is still in effect for him, and climbs to the hang from the ceiling above the door while Nimdor goes to check out the courtyard. Should an ettin come chasing after Nimdor into this room, he would be in for quite a suprise. The gate before them is over four yards wide and five yards tall. Fugen climbs above it as Nimdor cracks it open and slips through. He finds himself in a wide passageway that opens onto the courtyard in the middle of the tower. Signs indicate that this passage is used to transport supplies into the chamberlain’s area that the heroes have just passed through. This being a route for cargo, the passage is tall as well as wide. On the ride-hand side of the passage are the stables. Nimdor sneaks up to the far end of the passage. Within the courtyard there are two mighty gates. Both lead through the exterior wall to the outer gate. A tall wooden fence surrounds an area around the southern gate, nearest Nimdor. Beyond this fence, Nimdor can see two ettins. To amuse themselves, the ettins have hung a human corpse from a tall fencepost, and are using it for target practice with their javelins. At first it sounds like there must be more of them, but then Nimdor realizes that the ettins each have two heads, so there are four voices between the two of them. Each ettin takes two tosses, one with each hand each head cheers the toss of its own arm, so it is actually a four-way competition. Nimdor move silently roll is a 4+mods. Ettin’s listen rolls are a 17 & a 5 +mods inc distance (minus 16). Last edited by crueldespot; 16th of December, 2007 at 01:24. Nimdor sneaks back to the group and lets them know the situation. Flarrgj frowns. "They are giants? I have giants in my homeland, I have fought them before. Is combat an option?" "Not a good one. If we fight, we would be unable to avoid making a large amount of noise, and somebody would be bound to notice. This is assuming we can win, those are some pretty damn big muscles." "If noise is the only concern," Gizerak remarks, "then I have a spell that will eliminate all noise within a small area. I don't generally like casting it because it also prevents me from casting other spells when I myself am within its area, but if I cast it on some one else, say Fugen, then I could stay back where I could use my spells while he moved forward to surpress the sounds of battle. Be warned, however, I would not be able to heal whoever I cast the spell on until after it had expired." Thinking about this idea, Fugen nods his agreement. He trusted his own ability to stay out of trouble, even in the middle of combat, and felt that if this meant they could keep from raising a more general alarm in the palace, then it was worth the risk. "We'd have to wait for this evening for me to cast this spell," Gizerak warns, "As I said, I don't normally use it because of the way it hampers my spellcasting and would have to pray to the Duke for it." Signing, Fugen suggests that if they have to wait for evening for Gizerak to prepare the spell, then it might be worthwhile to wait until the ettin's went to sleep for the evening. If they relied on the evil spirits to protect the province as their prisoner had stated, then they might not set up a system of watches and thus might be vulnerable to individual ambushes if the first could be kept totally silent via the spell. "I doubt a small area would be worth it, the giants are too big. However, we might be able to sneak past them, they don't seem to be paying much attention. "Or we could kill them in there sleep?" Suggests Flarrgj. "Flarrgj... you never struck me as that kind of dishonorable warrior. I... really don't like it. I mean, I'm a thief sure, but not some kind of killer in the night. That's going a bit far, even if they are big dumb giants. If it's nighttime and they are sleeping, let's just sneak past." Flarrgj frowns. "They are enemies, is not much at risk here? They are not even human..." He protests. "Neither am I, or Kierna, or Gizerak, or Takeshi. Are you suggesting that it's okay to kill us in our sleep? I'm sorry, I'll go along with it if we must, I just don't like it." Practicing the meditation techniques that couriers used when forced to wait overly long to receive or deliver a message gave Fugen something to do during the course of the day as the group waited for Gizerak to adjust his spells, but he could feel the nervous energy within himself building after just a few days of high tension with little action to relieve it. He could only imagine that it was far worse for the rest of the party who were not trained to deal with such waits. After Gizerak has had a chance to pray for his spells, Fugen signs to instruct the others to focus there attacks on one ettin at a time. The faster they took out the one of the giants, the less damage it would be able to do. Fugen, in the meantime, would try to maintain a position that would prevent either ettin from raising an alarm. That might mean occupying the one who was not the focus of the party's attacks, or dancing between them. Either way, however, they party should not take Fugen's actions should he shift his own focus, as a cue to change their's. After a final reminder from Gizerak that he would be unable to heal anyone within the area of the silence spell and so they should retreat out of it's effect if they were badly injured, he gives Fugen a couple of extra healing potions (since he won't be able to do so) and cast's the spell on Fugen. Fugen also drinks one of his potions of mage armor, and gestures for the party to remain within the zone that is unnaturally quiet as they head through the doors to confront the ettins. Gizerak casts his spell of silence on Fugen. Abruptly there is no sound. There is almost no light either. As they open the door and sneak out towards the courtyard, it is almost dusk. The shadows have lengthened so that no sunlight reaches to their level. The sun is blocked by the tower around the courtyard, 100 feet high. The sky above is a deep purple. Fumbling through the darkness is even harder without a sense of sound. Those with unnaturally sharp nightvision, such as Kierna, are able to make their way through the gloom, but their vision does not extend far enough to see the ettins across the wide courtyard. Position of ettins not indicated, since only some members of the party can see, and those only a limited distance.